As a top West Florida art installation company, here at Suncoast Installs, we know how to hang art. Often we have clients contact us because they want to replicate art displays that they’ve seen in museums, galleries, and even other homes and that’s something that we are more than experienced in doing. What is it, though, that makes professionally installed art displays better than simply hanging a picture on your wall? Let’s take a look! When you see an art display that you’d like to replicate in your home, you likely don’t have any experience in creating this type of display yourself. When you give a professional installation company like Suncoast Installs the details on your chosen installation design, however, the chances are that it’s something they have created before and can create for you too. Why does experience matter when it comes to installing art in your home? 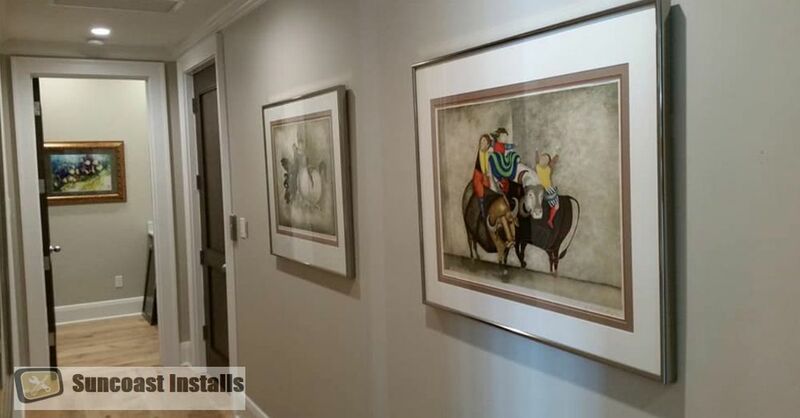 With experience to draw on, installation companies like ours are able to fine-tune your installation and create the best art display in your home. Most often homeowners invest in a piece of art because they like it, but they have no idea how to install their art piece to create the best visual experience. This is where a professional art installation company like Suncoast Installs comes in. All of our art installation technicians aren’t just generic art installers or handymen, they are also picked for our art installation work because they just have an eye for art installation. Why is that important? Because it means that you’re not just hiring a college student or someone who is trained in cabinet installation to create your art display in your home! Installing art at home, the average homeowner simply chooses an area of the home, hammers in the picture mounting hardware, and slaps the picture on the wall. As we can attest, however, there is much more that should go into an art display worth bragging about! One of our favorite ways to do this at Suncoast Installs is to make use of lighting. We have experience installing just about every type of accent lighting that you could imagine! We can professionally hang pictures that are framed with frames that already have a feature light build into them, we can create customized spotlighting, we can even help you to rearrange the entire lighting structure in the room to ensure that you get the best display possible for that art piece you have invested in. Sometimes you can see a professionally installed art piece, but even though you know exactly what it looked like in the store or gallery, you just can’t replicate that same display at home. There could be a number of reasons why you are unable to recreate the display that you saw, but fortunately, a professional art installer will be able to replicate any display so long as you can explain what it is that you are looking for! Another problem that homeowners run into when trying to replicate an art display that they have seen in a gallery, museum, store, etc. is that their home surfaces just aren’t the same as those where they saw the original display. For example, an art gallery has smooth walls without any divots, textures, or obstacles to get in the way during installation. Unfortunately, most home wall surfaces are not this easy to work with. Fortunately, though, professional art installers who know how to hang art are able to smooth out surfaces so that the professional display that you like so much can actually be replicated, making your home look like a real art exhibit! Not Sure How to Hang Art and Need Professional Assistance? Not sure how to hang art with that professional touch? Suncoast Installs can help! If you’re in West Florida and you need assistance recreating that perfect art display just give us a call today at 727-480-8358 and let us know how we can help you! Worried about inviting a stranger into your home and trusting them with your newest piece of art? With Suncoast Installs, you don’t have to worry about a thing because every one of our installation experts is fully vetted so that you never have to worry about your security! Previous PostTV Installation Cost: What Determines the Cost of Your Installation? Next PostFlorida Wireless Home Security Services Are Now Available Through Suncoast Installs!